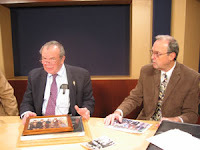 Chuck Langdon and I interviewed long time radio personality Bob Duckman on our "Out of the Past" TV show on Fairfax cable (also available on the internet) a few weeks ago. You may remember that our own Eddie Gallagher teamed up with Bob Duckman on WASH-FM after he left WTOP. Bob talks about Eddie in this interview and some vintage Gallagher is heard at the tail end of the show.